Kyalami Park was initiated in the mid-eighties by Anglo American. Originally intended as a residential estate surrounded by a racetrack it was anticipated that racing events would be held once or twice a year. However, the then-Minister of Sport, FW de Klerk, expressed the need for a formal racetrack where South Africa could host events more frequently. It was finally decided to move the racetrack to the southern boundary of Kyalami Park where it still stands today. The idea of a residential estate also changed and in late 1987 the developer began installing services to the vacant land. 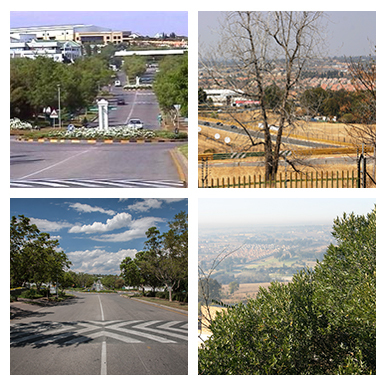 In 1989 vacant stands were put on the market for what was to become South Africa's largest business park. The land on which the Park was built officially became Kyalami Grand Prix Circuit, one of the internationally acclaimed venues where Formula 1 races took place. Today few people realise that when they come through the Parks security booms they are driving on what was once a Formula 1 racetrack. Boasting a wealth of motorsport heritage Kyalami has hosted to no less than twenty one F1 Grand Prix. Many famous drivers spun their wheels on what is now Kyalami Boulevard including the only South African born World Champion, Jody Scheckter. Other famous drivers include Nelson Piquet, Ayrton Senna, Niki Lauda and Nigel Mansell, the last driver to win on the old track in 1985 as well as Michael Schumacher and Alain Prost who, in 1993, won the last F1 race held on the new AA-Racetrack. A far cry from times of old, the roads in Kyalami Park now have a speed limit of 40 km/h.